The Patriots released Farrow from their practice squad Tuesday, Mike Reiss of ESPN.com reports. 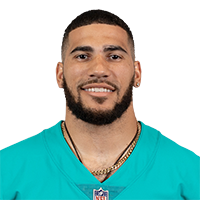 Analysis: Farrow was signed to New England's practice squad on Oct. 9, though after being released, the 25-year-old will look to continue his NFL career with another team. Farrow is in good shape after recovering from his ankle injury, Aaron Wilson of the Houston Chronicle reports. Analysis: After spending all of the 2017 season on injured reserve, Farrow was cut by the Chargers on Friday. With his ankle now healthy, he'll look to make an NFL roster in 2018, just as he did as an undrafted rookie in 2016. 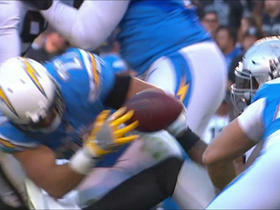 The Chargers waived Farrow (ankle) on Friday, Jack Wang of the Los Angeles Daily News reports. Analysis: Farrow cracked the Chargers' roster as an undrafted rookie in 2016, taking 60 carries for 192 yards and catching 13 of 16 targets for 70 yards in 13 games. He spent all of 2017 on injured reserve after suffering an ankle injury in the preseason, while undrafted rookie Austin Ekeler proved to be a capable backup for Melvin Gordon. If healthy, Farrow should get a shot with another team, though he'd likely enter training camp with an uphill battle toward a roster spot. 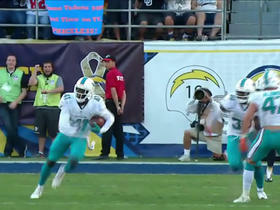 San Diego Chargers QB Philip Rivers throws his second interception to Miami Dolphins cornerback Byron Maxwell. 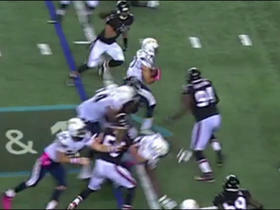 San Diego Chargers running back Kenneth Farrow powers through defenders for a 9-yard run.